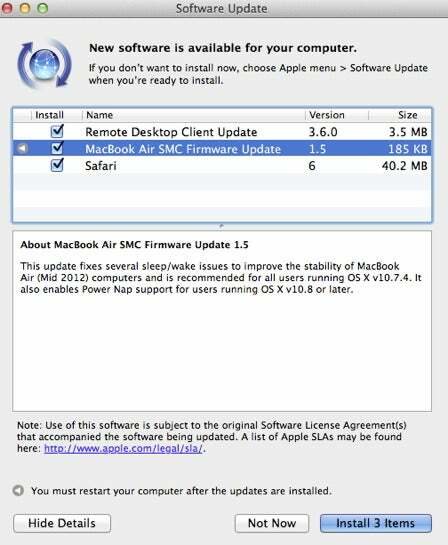 With Mountain Lion, Apple includes a Power Nap feature that allows recent SSD-equipped MacBooks to perform certain jobs while asleep, including backing up to Time Machine, checking for email messages, and performing some iCloud synchronization tasks. But owners of some MacBook Airs (2011 or newer) and retina display MacBook Pro models found Power Nap conspicuous in its absence when Mountain Lion was first released. 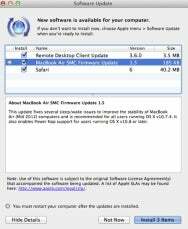 Late Wednesday afternoon, Apple made a firmware update for the MacBook Air models—called MacBook Air SMC Firmware Update 1.5—available via Software Update or directly from Apple. As of July 27, 2012, the update for retina display MacBook Pro models is listed as “coming soon.” Once you download the update, you just double-click it to run it. You’ll be prompted to restart your Mac and then the update will be applied. On a 2012 13-inch MacBook Air that process took a couple of seconds. To make sure the update was applied correctly, launch System Preferences, select the Energy preference, and look for the Enable Power Nap option in the resulting window. Updated 7/27/12 to indicate status of update for retina display MacBook Pro as "coming soon." Provided link to direct download.